Sheri Salata and her daughter, Alexis, a third-year UI student studying cinema, on Clinton Street in Iowa City. Photo courtesy of Sheri Salata. 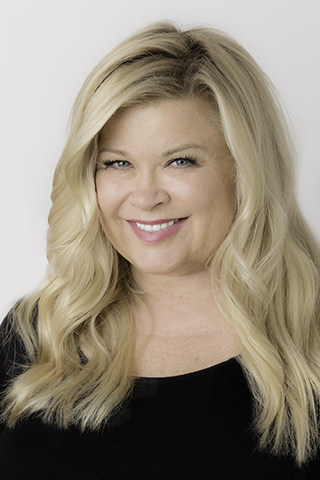 In the late ’70s, Sheri Salata, a former executive producer of The Oprah Winfrey Show, the highest-rated talk show in TV history, decided to attend the University of Iowa without ever visiting campus. Then living in Waukegan, Illinois, Salata and her best friend were committed to being college roommates and both applied to the University of Illinois. But when her best friend wasn’t accepted, Salata sent for a brochure from the University of Iowa. Salata worked for Winfrey for almost 21 years, both as a producer for The Oprah Winfrey Show and later as co-president of Harpo Studios and the Oprah Winfrey Network. Last spring, she made headlines after announcing she would leave her role as co-president of OWN to cofound a new company, STORY, a female-led media and branding company that develops content for print, TV, film, and other media. Invited by the UI Foundation, Salata will visit the UI for a Life with Phil Talk on April 27. The event is part of Phil Was Here, a UI Foundation program to inform campus about the impact of “Phil,” (short for “philanthropy”) and the critical role that gifts and other donations play at the UI. Sheri Salata will visit campus April 27 for a Life with Phil Talk at 3:30 p.m. in C20 of the Pomerantz Center. Faculty, staff, and students are invited to enjoy food trucks and sign thank-you notes to the university’s donors during Faces of Phil, from 11 a.m. to 2 p.m. April 26 on the T. Anne Cleary Walkway. This year, Phil Was Here will feature several days of activities. On April 24, faculty and students supported by scholarships or endowments will wear special stickers, and buildings across campus will be similarly decorated on April 25. Food trucks and Polaroid cameras will populate the T. Anne Cleary Walkway for Faces of Phil on April 26, and the week’s activities will culminate in Salata’s Life with Phil Talk on April 27. Gardial invited Salata to join the Tippie Advisory Board, and she accepted. She has supported nine UI students since 2014 through the Sheri Salata Women Who Lead Scholarship and is giving to innovation initiatives at the Tippie College of Business. She says that philanthropy is more than writing a check or volunteering your time. “You have an opportunity to be of service just by bringing your best energy to any encounter. I think we can expand the idea in all our minds about what generosity of spirit is: It’s about not hoarding your best qualities. It’s being a light,” she says. Although she entered the university as a pre-med student, Salata found herself on academic probation by the end of her first semester. She says her “destiny was turned in a new direction,” and during her sophomore year she began taking business classes. Salata spent about seven years trying a variety of occupations, such as managing a 7-Eleven, managing toy stores, and working as a typist, none of which she felt was a good long-term fit. Then she met Perry Stebor, an executive producer at Grey Advertising in Chicago. Salata describes this as another moment in her life that changed her destiny. 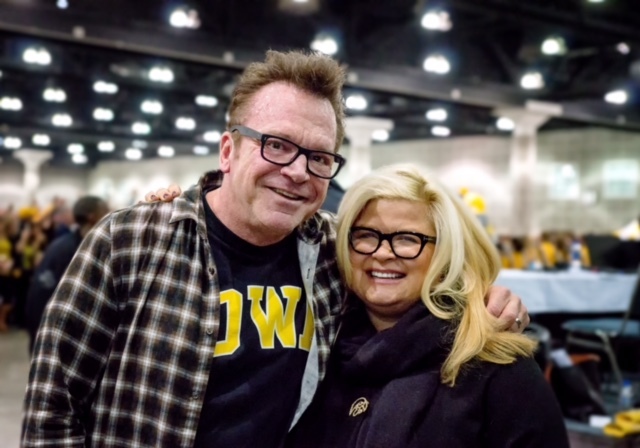 Sheri Salata hangs out with fellow UI alum Tom Arnold at festivities for the 2016 Rose Bowl Game. Photo by Matt Jansen. Salata would use those skills when she began working for Winfrey as a promotions producer on The Oprah Winfrey Show and eventually became the show’s executive producer through its historic finale in 2011. STORY’s first print project is a memoir by Salata titled A Year at Belle Vie, forthcoming in May 2018 from Harper Wave, an imprint of Harper Collins. She looks back on her time after college, trying different jobs and finding each one lacking, and says she wouldn’t advise others to do the same. “You can go through life saying, ‘Not this, not this, not this,’ or you can let happiness be your compass and you can say, ‘I like this; more of this, more of this, more of this.’ You can understand that putting one foot in front of the other toward your happiness usually leads you more quickly to where you want to go,” she says.